Disability & Caring: One Family’s Struggle due to a lack of Strategic Housing. One Family’s Struggle due to a lack of Strategic Housing. I write from personal experience and not from any formal qualifications in urban planning, architecture or the like. I do though come from a background of working in international engineering project management, having worked in post-Gulf- War II, Iraq for 2 years, where I spent time living in a 100, person tent, a 20ft container, old classroom made into a dormitory. I then spent another 2 years working in Abu Dhabi as a project manager on the master plan project, developing the plans for the building of a new off shore port and industrial zone. So I do have some knowledge of strategic and master plans. I also have knowledge of housing in the USA as I spent many of my summers as a teenager working on my Uncles real estate portfolio over there. 2007 my life changed when my Husband caught a staphylococcus infection in his neck, that over the space of four days turned a very fit healthy man into a partial tetraplegic. Most of 2007 I spent living like a Hobo, spending as much time as I could with him in hospital. 2008 he was well enough to leave hospital and being what many would say was naïve about what living with someone with a severe disability would be like, we decided to try and still live the life we had planned in Australia, as I had a job waiting for me out there, that had been on hold, pending his health. Unfortunately, by May 2009 my husband’s health deteriorated to such an extent that we felt we had to return to the UK where access to the NHS would we felt ensure his longer term health safety. Back in the UK we choose to set up in Peterborough, not through any particular love of the place, but felt it would mean that I could commute easily into London, where I was the most likely to end up working with my skill set, but still be within a reasonable visiting distance from family in Lincolnshire, or so we thought. At first we set up in a hotel as finding wheelchair accessible rental accommodation was near impossible, when I was no longer working, Husband was not entitled to disability benefits at first having been abroad for a year. Getting any sort of support when classed as homeless even the GP refused to register us, was quite an eye opener to both of us, both having paid our taxes and national insurance all our working lives. We finally saw that our only way into the system was to rent a place that we knew would be unsuitable so that we at least had an address, to gain access to the services we needed. So we bought numerous ramps as the bungalow had steps, Husband was washed in a kids paddling pool with the shower hose stretched over. Then suddenly, having an address, and as if by magic, district nurses, social services, GP’s all appeared to actually give a damn that we were struggling. October 2009, Husband is assessed as needing Continuing Health Care, which I hoped would mean I could return to work, so that we could be masters of our own destiny. Social Services managed to find the only available accommodation that had a small wet room, so feeling it had to be better than where we were, we moved leaving the squirrels in the roof to themselves and our landlord without his source of free electricity to heat his greenhouse. (Yes, I kid you not). Very soon after moving in it became very apparent that we had made a huge mistake, so asked to be put back on the housing list. The two-bedroom flat was way too small. The wet room too small for Husband’s reclining commode, and inaccessible sink, means washing out of a plastic bowl. The Master bedroom way too small for two single beds, one of which a hospital bed and have sufficient room for care workers to use a mobile hoist, sliding sheets etc. The construction of the building precludes the fitting of anything to the walls or ceiling. The kitchen inaccessible, the dining room too tight after putting a desk in for the care workers to sit. The lounge was extremely small, meaning that Husband has to sit in a very particular spot so no one taps his feet. The spare room became our only means of storage, plus a bed for me when / if we have care workers on night duty. Husband’s life is in two rooms, it finds it impossible to use the shared facilities on site as all the doors are not wheelchair user friendly, he finds the type of unfortunate people housed here, through no fault of their own are mainly not the type of people he wishes to mix with. If on sunny days he tries to sit quietly in a garden area he finds his privacy is invaded, also there are no sheltered areas so that he does not become cold. Where we live feels like a care home even though it is supposed to have a balanced residency mix. There are also access and safety issues surrounding the only very small lift which gives access to this first floor accommodation. All this was bad enough, then after complaining for months regarding the invasion of second hand cigarette smoke coming from our neighbour she unfortunately set fire to her flat. Trapping us in our flat with smoke bellowing under our door. Luckily the fire crews brought the fire under control as I believe they were starting to think about smashing windows frames on our side to try and evacuate Husband and myself. This procedure would have certainly broken many bones in his body. Hope readers realise how angry we were about this, having near prophesised that this was a credible risk. Following this our GP kindly agreed to write us a letter which they hoped would aid us in convincing people that we indeed did need to move. The first stage was a visit from a housing OT. Looking back alarm bells should have rung when much of her conversation was about making compromises and not about the type of accommodation Husband needed to enhance his life or his independence. We were told to keep looking at the choices list for suitable housing and apply when it became available. So I did just that, a sole destroying exercise looking at properties that were extremely unsuitable. It also became apparent that if we applied for a 3 bedroom property that we could adapt, we were automatically discounted as we could only look at 2 bedroom properties. Property 1 – Dogsthorpe – a semi-detached house that had obviously been converted for a disabled child. 75% of the property was inaccessible. The through floor lift would have been unsafe for tetraplegic Husband to try and use. The bedrooms were too small. Also it was on a huge estate, that I worried about our personal safety. Property 2 – Castor – a small bungalow - all the rooms were too small, it only had one bathroom, this village is extremely small so isolation would have been a problem, too far away from our Lincolnshire based family. 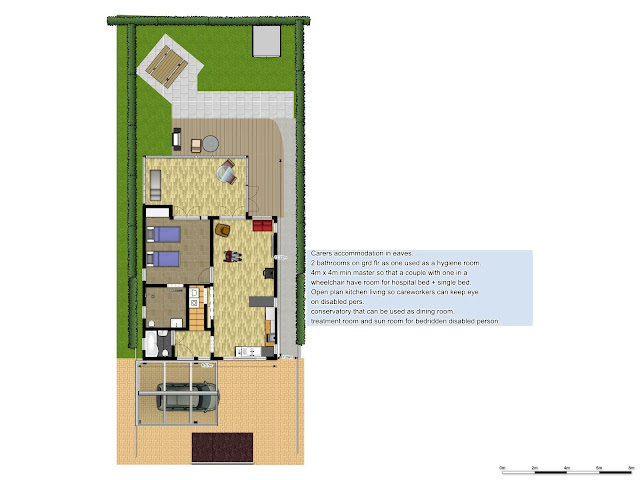 Property 3 – Yaxley – a reportedly purpose built wheelchair accessible bungalow. This property was perfect for a single, fairly fit and healthy paraplegic, or part time wheelchair user, but no way met the specialised needs of my husband. The living area was so small by the time you had a small couch in the room there would be no room for a wheelchair, tables etc. There was nowhere to sit the care-workers. The very small kitchen totally inaccessible. The master bedroom was nearly big enough but not quite big enough. The wet room was huge but there were no separate washing facilities for care workers. Storage space was inadequate. The over looked on all sides, garden had open iron work fencing that provided absolutely no privacy what so ever. Having looked at list after list it is quite obvious that Peterborough does not have any specialised housing stock for disabled people who have such substantial needs that they have care workers on site for much of the day. What have we done to try and help ourselves. Back in Oct 2012, I wrote to the housing team to try and get a more specific targeted approach to our housing need, but to no avail. Having been in Peterborough since 2009, we have suffered huge problems with getting appropriate care provision that has meant I have been unable to work. Our family state that the hour plus each way to visit is too far to come to help us out a bit. We then decided to try moving to Spalding, where I could just about manage to commute into London if I had to and our relatives would be a stone’s throw away should we need the extra support. 2014 we were accepted onto this register, but by 2015 due to the Localisation Act we are deemed to have insufficient local connections, our family living in the Lincolnshire district one over. We appealed but lost. Late 2014 I met the team at Partners Foundation, a not for profit Housing Association, who said they would try and help us move. They would buy a suitable bungalow, help us apply for a DFG. We are at the moment bogged down in local authority red tape, trying to make this happen. Again Council paid Housing OT’s are making our lives difficult by taking the councils part on cost with absolutely no regard to the clients actual need. There is a definite conflict of interest here that groups trying to secure better housing for disabled persons need to discuss. · No cognisance taken of full time care-worker needs, such as office space, washing space. · No cognisance of care-workers’ health and safety, safe working environment. · Nothing for the family carers either, e.g. I need a bath as I have a lower back injury, that responds to muscle soaks. · People living on top of each other 24/7 need time out spaces. I used to play the guitar and paint can’t do any of this no-where to do it. · Adequate storage, equipment recharging points. · Been told I cannot have a hospital at home environment even though that is exactly what is needed in ours and many continuing care cases. Master Bedroom – minimum working space needed is 4m x 4m to take account of Working space needed around the hospital bed, plus room for a single bed for spouse to do caring duties at the weekend. Adequate manoeuvre room for long leg length electric wheelchair, e.g. Husband chair needs 1.65m reversing clearance to turn to miss his toes. Wet Room – again minimum working space 2.5m x 2.5m although ideally it would be bigger to take the use of a shower trolley more easy. Hygiene Room – a separate washing facility for care workers, visiting health workers, other visitors. People with long term conditions are often immune suppressed or susceptible to cross infection. Husband for example has bouts of explosive diarrhoea caused by C-diff. It seems a difficult concept to get across to housing officials that people with long term conditions their homes are not just a home but also a place of work for their care workers. Lounge – many home designs I have seen for wheelchair accessible properties make this room too narrow to accommodate larger electric chairs, plus have room for adequate seating for others using the property. Conservatory – this would be seen as a luxury by many, but this multi-purpose space would be an immeasurable life quality enhancing space for us. It would allow adequate space for dining, the use of a tilt table, space for carrying out physiotherapy, sheltered semi outside space when Husband is bed bound for mental health. Time out space to get away from care workers. The Eaves – this flexible space could be configured to house in our case the spouse’s week day bedroom, give the possibility longer term of a live in care-worker’s bedroom. It also gives the spouse in our case a place to escape. Another small shower room would also be needed. So two bedrooms plus a bathroom or two ensuite bedroom / bathrooms. The design could be adapted to meet people’s needs very easily. Its open plan design is wheelchair friendly and modern. Windows could also be configured to make it possible to make the design a part of a semi-detached. I would also contend that until non-conventional building systems are explored, such as USA type buildings, kit homes, wood frame houses, homes will not be built in sufficient numbers and quick enough to make a significant difference to disabled people. These modern building techniques have the added bonus of being very eco-friendly, warm, adaptable from a base plan, quick to build. The use of solar power to cut disabled peoples utility bills is also an absolute must. For example, my husband has no body temperature control so our heating bills are horrendously high. Please note I am skipping writing about the “normal” adjustments, such as accessible wash basins, wheelchair height light switches etc. Too much detail. Technology is very under used in British homes, disabled people are still struggling trying to use old fashioned key locks, door handles etc. In the kitchen there are moveable height units available but they are out of the price reach of most. My husband would love to have a robot monitoring his well- being most of the day, with care workers just appearing when needed, as he finds their constant presence an intrusion, especially in light of unfortunately the poor quality / fit of person provided. Consequences to us of bad housing. · I have been manually lifting 6ft husband from bed to chair (vice versa), as no space to use a hoist. I now have serious deterioration in my lower back which may eventually mean that I will end up using a wheelchair myself. · I have extremely painful knees and reoccurring pains in my wrists. · I have been covering the refusal of care companies to work here due to the H&S risks, for the last 2 years, 24/7 with absolutely no breaks. I get 3 hours sleep on a good night. · Indirectly it has contributed to me losing out on over £300k in earning potential since 2009. · Not being able to work has cost the council in housing benefit. · Husband often becomes very depressed about his situation, does not understand why the NHS would bother saving his life when he wasn’t going to be looked after. · Husband is angry that he paid into the system working for over 45 years only to turn around and find the system he paid for does not want to know or help him. · But no one sees the urgency of our case. We had a meeting with interested parties on 18th April which agreed most of housing principles we need, ie size of bedroom but we are still at an impasse regarding the pure health and Care-worker workplace H&S related items. For example to prevent cross contamination we need a hygiene room for visitors / care-workers. It is all down to funding, we estimate we need to find from other sources £40k (£200k in total with cost of base building taken into account) to make the alterations we need to make a home that is safe for Hubby to live in. It is now August 2016 and still we have had no positive outcome to our housing situation. Everything we try fails to unlock the situation. i have kept our local councillors up to date, have written yet again to Peterborough housing. Have secured some funds from the NHS for equipment. Very dangerous and depressing to be left in this situation.